Call us at (631) 715-2693 and ask about our new customized pricing! Discover an amazing new choice in senior living options where you will be able to customize your brand new apartment home, re-imagine your lifestyle and enjoy invaluable peace of mind. Envisioned by Gurwin, Fountaingate Gardens will offer an innovative approach to retirement and an unrivaled gold standard of care. Live surrounded by lovely grounds, including lush landscaping and a relaxing pond near your favorite Long Island attractions. Our central location also gives you easy access to beaches, airports, Manhattan and more. Add our exceptional on-site services and amenities and you have an ideal setting for a dynamic, independent lifestyle. Learn how you can be part of the area’s newest life plan community (also known as a continuing care retirement community). Start planning now to enjoy your future in Fountaingate Gardens! Check out the Tulip! 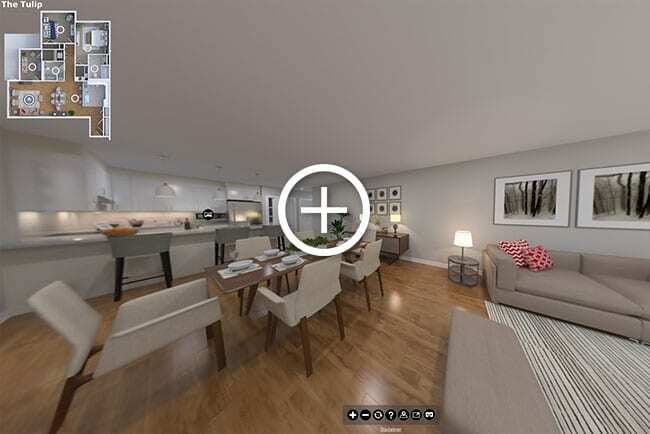 Click here to take a virtual tour of this layout. This is a conceptual, artist rendering of the soon to be built Fountaingate Gardens and is subject to change. Live empowered, independent and free to discover new ways to enjoy life. Our new construction apartment homes can be customized to fit your style. The gold standard of Gurwin ensures quality, stability and value.